The Glade at Rosliston Forestry Centre in the Heart of the National Forest is a wonderful marquee wedding venue. 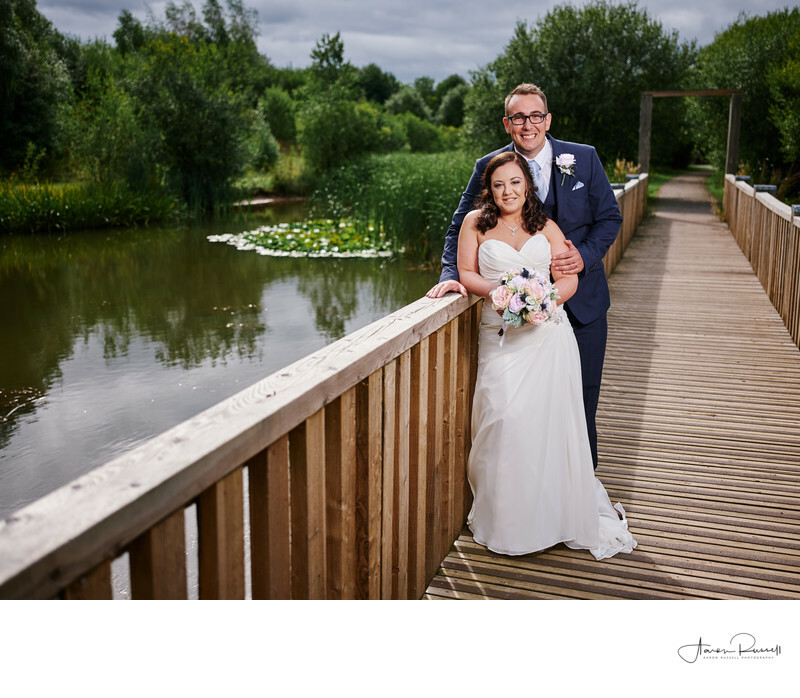 Surrounded by beautiful woodlands and lakes it makes a fantastic choice to have your wedding at in Staffordshire. While the guests were enjoying some coffee after the wedding breakfast I took the newlyweds for their photographs and took them to a favourite spot of mine at the venue, being this lovely bride over the lake. I placed them with their backs towards the sun so that they didn't squint and feel uncomfortable in the bright conditions and exposed my camera settings for the beautiful backdrop of the lake and surrounding woodlands. In order to light them correctly, I used my Profoto B1 portable studio strobe and took the photograph on mt Fujifilm GFX50s 51MP medium format digital camera using the 45mm f2.8 lens. The colours the lens and camera combination allows me to capture are breathtaking. When Dawn and Joe saw the unedited image on the back of the camera they were blown away. You can just imagine how speechless they were when they received their photographs from the wedding day. The review I received on Google from Dawn and Joe was amazing! Knowing how much my photographs meant to them is an incredible feeling and something that I never take for granted! Location: The Glade, Rosliston Forestry Centre, Rosliston, Burton on Trent, DE12 8JX.